If you’ve been to Luray and Page County in the last week, you’ve noticed a bit of construction going on in our downtown area. That’s because our West Main Street Bridge is officially being replaced. For the safety of our locals and visitors to the Town of Luray, the town officials and council have worked in conjunction with VDOT to proceed with the replacement of the bridge joining East and West Main Street. 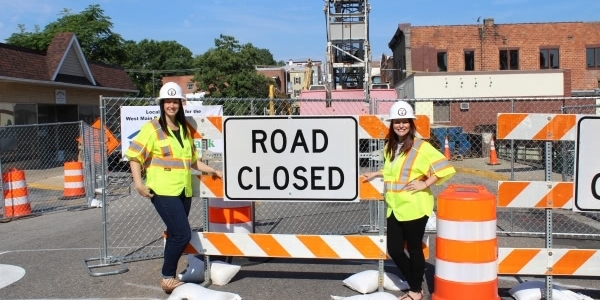 The bridge and a portion of West Main Street, just past the light at the intersection of Main and Broad, was officially closed on Monday, July 16, 2018. The current expectation is for the bridge and this portion of the street to remain closed until December 31, 2018 when the new bridge is in place. The bridge project was officially started in 2014 with public stakeholder and information meetings to introduce the idea and begin working towards fulfilling this need. In February 2017 the anticipated project funding was completed, which was followed in July by an RFP as the town began looking for an architect and construction company. The contractor was hired in February 2018 and on-site preparations began just last month as the plans and permits were finalized and then approved by VDOT. The detours/closures began this past Monday, July 16, 2018, and demolition is planned for this coming Monday, July 23, 2018. The town’s goal is to have the road reopened in December 2018 with the completition of all construction in June 2019 and bridge dedication in July 2019. Orders Construction Company, based out of Saint Albans, WV, is the bridge construction company. Orders Construction specializes in general contracting and bridge construction and has built a reputation of dependability, honesty, and loyalty. Under the leadership of Earl Adwell, Project Manager, and Bryan Chrisman, Assistant Town Manager for the Town of Luray, the team hopes to remain on track and will vary in size from 15-30 guys. These men will not only be working in our community, but will also be staying during the week at one of our local hotels and eating in our local restaurants. Gina Hilliard, Luray-Page County Chamber of Commerce & Visitor Center President, and Meredith Dees, Luray Downtown Initiative Program Director, met with Earl this morning on the bridge in the midst of all the construction equipment to familiarize themselves with Earl and his team. We anticipate working closely with Earl and the Town of Luray to help the Luray-Page community stay in the loop on what is happening with the bridge and in the downtown area as we go through this period of transition. We will do our best to keep the lines of communication open as the project moves forward. If you are unfamiliar with the area, we highly recommend checking out our map of the construction area and a few of roads surrounding the zone. Remember to obey the detour signs and they will help you get around our temporary mess. And, as always, feel free to reach out to our staff at the Luray-Page County Chamber of Commerce & Visitor Center to answer any questions you may have about the downtown area, how to get around, and the businesses around the construction zone. Our businesses aren't letting the construction ruffle them, they're still open and ready to serve our community and visitors during this project, so don't let the dust keep you away. Additionally, we will continue to shoot informational videos on the project and share them on our Facebook and YouTube pages, so you can watch them at your own convenience and stay informed with the changes.